Yesterday I headed out to the Brimfield Antiques Show for one of my absolute favorite events of the year. I tell ya, it is a good thing I live in a 700 square foot condo – otherwise I would be one of those who show up with a U-Haul truck to pile in all of items I fall in love with! Someday when I have a studio it will be completely decked out with Brimfield goods. I swear. I swear. I swear. Every year I hit up the tent of a guy who sells mirrors, frames and shelves made out of antique barn wood and tin. I love this stuff (Wendy=slightly obsessed). It reminded me that I wanted to share the wall display I did in my own home with some of the frames and a mirror. I absolutely love it when clients get creative with their photos and display them as art. 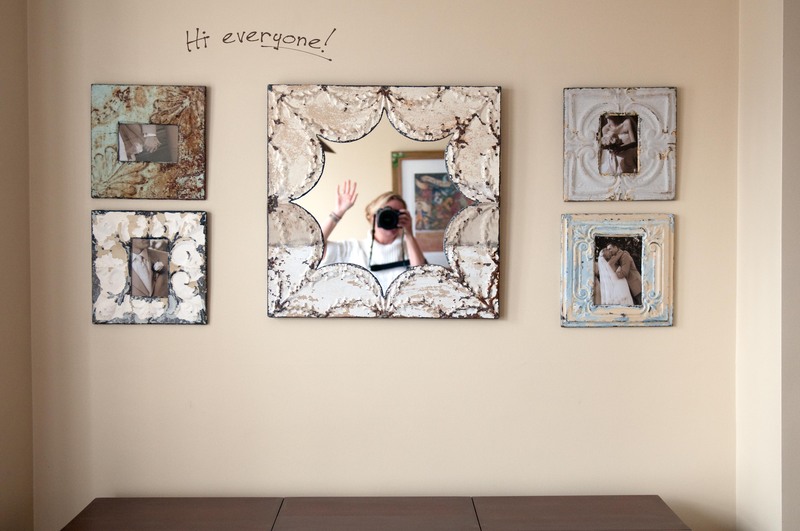 There are so many fun and funky ways to enjoy your photographs that fit with the aesthetic of you home. Why just save them on your computer??? Be on the lookout for some client collections here soon! PS That is me, waving “HI!” to all of you! And yes, I know that I need to put something on top of that wine cabinet to fill the space between it and the frames. Don’t judge. Is that your St. Patrick’s Day float wave?